We’d love your help. Let us know what’s wrong with this preview of The Mirror of Zen by Boep Joeng. The sacred radiance of our original nature never darkens. Simply do not give rise to conceptual thinking. Zen Master So Sahn (1520-1604) is a towering figure in the history of Korean Zen. In this treasure-text, he presents in simple yet beautiful language the core principles and tea The sacred radiance of our original nature never darkens. To ask other readers questions about The Mirror of Zen, please sign up. Good book in short easily digested sections covering a wide range of topics. While some speak directly to begging monks, most of the sections can be applied to the lay person's daily life. I'd recommend skipping the English addition preface unless you want to see how pride and arrogance can still be dominant personality traits in a high ranking monk even after decades of practice. Inspiring read that provokes thought. The words put into practice. This is a short text (157 pages including preface and endnotes). The body of the text is 86 short paragraphs (some only a sentence, rarely more than 4 sentences) of "advice" drawn from a variety of sources. Each short paragraph is numbered on its own page and usually comes with commentary and a gatha. Do not think of these snippets as some sort of truncated "quote" book or cutesy anecdote anthology. Of the 86 items, I think probably ten are somewhat superficial. Five are probably throw-away (the This is a short text (157 pages including preface and endnotes). The body of the text is 86 short paragraphs (some only a sentence, rarely more than 4 sentences) of "advice" drawn from a variety of sources. Each short paragraph is numbered on its own page and usually comes with commentary and a gatha. Do not think of these snippets as some sort of truncated "quote" book or cutesy anecdote anthology. Of the 86 items, I think probably ten are somewhat superficial. Five are probably throw-away (the lineages ones). The rest vary from intense and direct to vitally specific. Like all works regarding Zen, there are conceptual challenges that make the semantics seem contradictory or absurd. I think though the text is "short" and contains "digestible" pieces, it is definitely not for beginners. I think to fully get the worth out of this text, one has to be rather familiar with a lot of the [Eastern] Zen principles/ideas. Though beginners might approach this text successfully, I think this is more suited to be a sort of QRG that seasoned practitioners would carry around in their pockets. I think this book is more for zen meditation Buddhist, not so much for casual reading. I tried. Three stars because I do not meditate and I am not a Buddhist, but there were many interesting quotes that I will take from this. I liked this book and am enjoying reading the Korean Zen masters. There is a simplicity, directness, and lack of pretension to the Korean style. This book is a translation of Master So Sahn's (1520-1604) verse on the core teachings of Zen with commentary by a Korean monk, Boep Joeng. But there is also a c I liked this book and am enjoying reading the Korean Zen masters. There is a simplicity, directness, and lack of pretension to the Korean style. 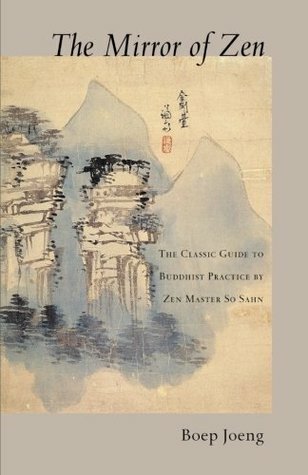 This book is a translation of Master So Sahn's (1520-1604) verse on the core teachings of Zen with commentary by a Korean monk, Boep Joeng. Given this challenge and the need for practice, Master So Sahn then talks about the importance of keeping the precepts. The commentator Boep Joeng notes that To keep the precepts is to not follow after mind-habits that do occur. Not giving rise to thinking is the goal of meditation. This book was very easy to read. Each chapter starts with a small verse/quote from elsewhere with a few paragraphs of commentary. As you would expect from a book on Zen, The words are few and very direct. Pointing to a meaning instead of endlessly explaining it. Using words is already taking a step away from any truth it's trying to convey. The book is self-aware in that. Use it for inspiration, but look inside for the true teaching. Overall, I enjoyed this light, airy book that leaves more to be This book was very easy to read. Each chapter starts with a small verse/quote from elsewhere with a few paragraphs of commentary. An easy Korean zen masterpiece that can help the novice and the master walk through the wisdom of the Buddhist sages!